Gabby Giffords remembers facing her assailant at his sentencing. "Beady eyes," she said of Jared Loughner, who shot the former Arizona congresswoman in the head with a 9mm Glock pistol. Six people died and 13 were injured that day when the deranged gunman opened fire in front of a Tucson supermarket. At the sentencing last November, Giffords sat stoically - staring Loughner down - as her husband, Mark Kelly, spoke to the court. "Well, yes, he had some interesting expressions on his face," said Kelly. "And she did not look away." In an exclusive, wide-ranging interview with CNN, Giffords and Kelly understand they are now in the center of the heated debate over gun control and background checks, while still struggling to rebuild their lives after that day in January 2011, when their lives changed forever. On Wednesday, Defense Secretary Chuck Hagel warned North Korea that it is "skating close to a dangerous line." Officials in South Korea have elevated their readiness level as they prepare for the possible missile test North Korea has threatened to launch. Kyung Lah reports that people in South Korea believe Kim Jong Un could act between now and April 15, which is the 101st birthday of his grandfather, Kim Il-Sung. The general perception of the young new dictator is that he's not well liked by South Koreans. "The more this goes on, the more they just view him as an irresponsible man-child," says Lah. Christiane Amanpour spoke with experts who say the belligerent rhetoric is business as usual from North Korea. The unknown factor in this instance is Kim, who is trying to impress his people by standing up to the United States. Anderson Cooper asks National Rifle Association President David Keene why he doesn't support expanded background checks. Keene also responds to a 360 hidden camera investigation that shows how easy it is to buy guns at gun shows without showing ID. A hidden camera investigation demonstrates how easy it is to buy guns at gun shows without giving identification. CNN's Martin Savidge explains the results of the undercover report. Background checks are not required for private sales, but the seller is legally obligated to check the buyer's ID to verify that person is not from out-of-state. The CNN crew that visited Tennessee, South Carolina and Georgia was able to purchase several weapons without having to prove residency or fill out paperwork, but not in every interaction with a seller. In once instance, a seller tells our producer that he got a gun "off a police officer." The total weapon haul from the weekend was three semi-automatic handguns with extra magazines and one semi-automatic rifle with a 30-round magazine. The total spent was $2,800. No identification was given, leaving zero paper trails. The guns were turned over to CNN security to deal with. Where is Elián González now? Randi Kaye reports on the international custody battle over Elián González 13 years ago, and what's happened since then. CNN's David Mattingly reports on a scanner call from firefighters explaining that they've been taken hostage inside a Georgia house about 30 miles northeast of Atlanta. The standoff ended after SWAT team members entered the residence when they believed the four firefighters were in immediate danger. They exchanged gunfire with the suspect who is no longer alive. One officer was shot during the rescue operation, but the Gwinnett County police spokesman says the injury is not life-threatening. All of the hostages are safe and suffered only minor injuries due to the explosives used by the SWAT team to distract the suspect. The neighbor of a man suspected of holding firefighters hostage in Georgia, about 30 miles from Atlanta, describes witnessing SWAT team members enter the house. Is it easy to purchase a gun at a gun show without doing little more than paying for it? 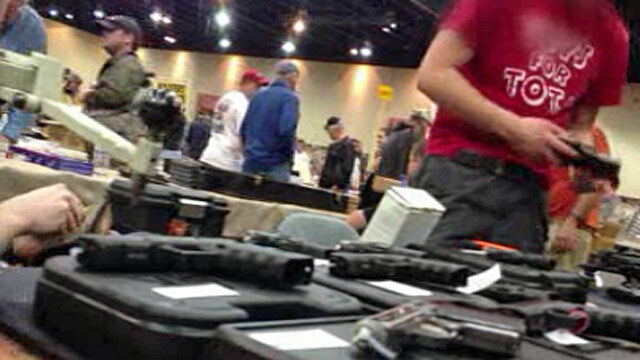 CNN went undercover at five gun shows in three states to find out. While background checks are not mandatory for private sales, the seller is required to check the buyer's ID to verify the person is from that state. The producer who visited Tennessee, South Carolina and Georgia was able to walk away with several weapons without having to prove residency or give any personal information – but not in every interaction with a seller. Tune in at 8 and 10 p.m. ET to see the investigation. Following the report, Anderson Cooper will ask National Rifle Association President David Keene why he opposes universal background checks that proponents say could prevent criminals from obtaining guns.